Admittedly, ambient music is a genre that takes patience and an open mind to become interested in. Believe it or not, I used to be one of those closed-minded metalheads that assumes anything not metal is bad. Over the last several years, however, I have broadened my horizons. One of the best thing's I've ever done, as I have discovered countless artists who create beautiful, passionate music that energizes and transforms one's outlook on life. I realize that I run the risk of over dramatizing musical listening pleasure by describing music the way I just did, but the fact remains. When I'm in a sour mood, I can relax and just chill to some amazing music. Lately I have stumbled across an album from a Dutch duo who go by the name Myosotis. Released by Hidden Vibes--the label that brought us masterpieces from Endless Melancholy and A Veil of Water--"Too Little Too Late" is an album chock-full of seemingly boundless soundscapes. This music sounds something like what the cover illustrates. Picture yourself gliding across sweeping green fields and immersed in cool sunlight as the music takes you to far flung places of the imagination. This music provides that sensation. Contrary to what some may believe, I am very selective about what ambient artists I can listen to. For example, the ambient drone music to me sounds flat and uninspiring. Others try to get too cute with electro-pop elements that somehow lose the vibe of ambient brilliance. 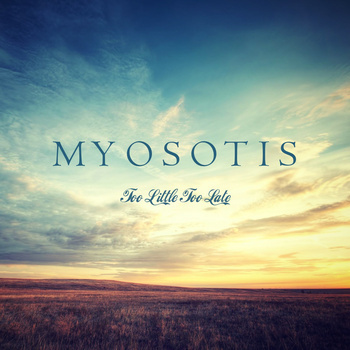 Myosotis has released an album that sticks with you. It is the kind of music that somehow wraps around your senses, but does not strangle the listener. It is memorable in that it does not embed itself into your conscience. This is a feat that is difficult to accomplish, especially by ambient artists. Take a listen to the album below. This is a FREE download so if you like it, you have nothing to lose. Warning: Be patient and allow it to grow. With extended time listening, you begin to like and appreciate it more. As always, thanks for reading and enjoy! !